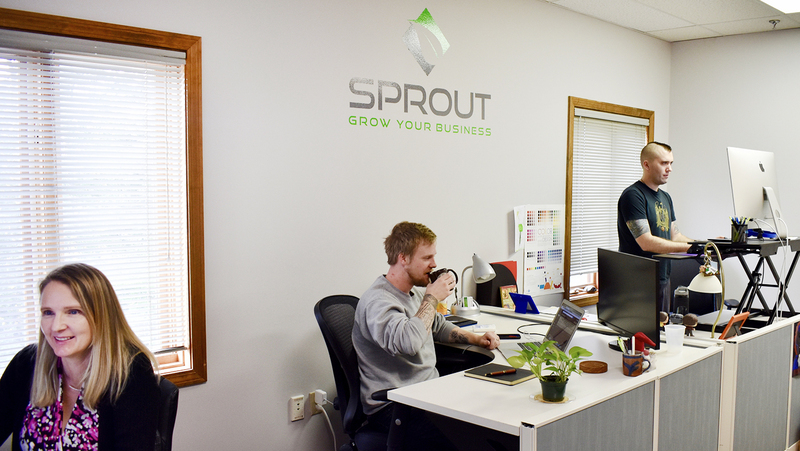 Here at Sprout, we help small businesses get online and become more relevant with their marketing. We’re experts in website design, SEO, email marketing, social media, and more. We make our impact on the world by helping businesses grow through superior digital and print marketing - both in our backyard as well as nationwide. In order to bring about the best results for our clients, we focus on collaborating. Some of the greatest solutions come about when each team member brings their experience and expertise to the table. Our team includes graphic designers, SEO technical experts, email marketing gurus, bloggers, social media managers, and print designers. To us, Real Work means making a real difference in the lives of our clients. Every time we fine-tune someone’s website, improve their SEO, or grow their social media presence to bring in new business, that’s a good day for us. Getting Real Work done means helping businesses succeed. At Sprout, every day brings new challenges and opportunities. You might catch our design team building a fresh new website incorporating the latest design trends and web technology. Or you might spot our content team researching and writing blogs, or creating custom email pieces. You could find our sales team checking in with happy clients and sharing updates. If we’re not working, we’re cracking jokes and brewing coffee. When it comes time to get into the grind, our focus is on efficiency. As a growing company, we’ve faced and overcome plenty of challenges in the world of project management. If we can’t harness efficiency and refine our process to help more businesses grow, we’re not doing things right. ActiveCollab helps us keep things in one dynamic place. Every Tuesday, the Sprout team gathers in our Conference Room to sip coffee and strategize the week’s projects on ActiveCollab. Everyone keeps a tab open for ActiveCollab throughout the day, where we update each other regularly. It’s handy for our sales team when they’re on the go, or for our writers when they’re working remotely. In ActiveCollab, we break down projects into phases. Each phase has tasks assigned to specific team members, with deadlines. This helps us see who’s working on what, and when the tasks are due. In the grand scheme of providing marketing and design services for small businesses, ActiveCollab keeps the flow going. While it has all kinds of dynamic functionalities, it meets Sprout’s needs most specifically in the areas of efficiency and project momentum. For us, it’s more than just a piece of software - it’s project management at its finest.